Somebody made a lot of money today and it wasn't just the Dallas Cowboys. Ahead of the Super Bowl, America's Team took a step towards sustainability, today partnering with waste management company, Totally Green. 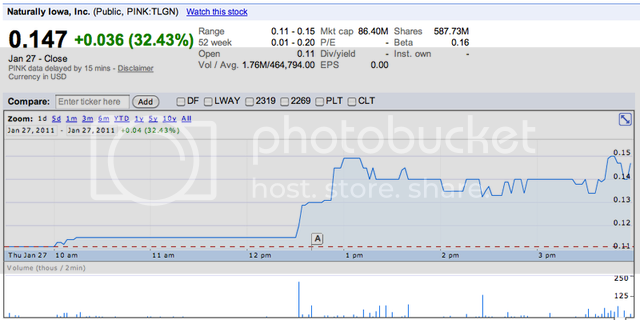 The company's penny stock, which is listed on the Pink Sheets under the symbol TLGN, shot up a whopping 33% in less than an hour on the news. The sponsorship, which will run for 5 years, is the highest profile deal to date for the Tulsa-based company. An ORCA Green Machine has already been installed in Cowboys Stadium, which will turn organic waste that would have ended up in a landfill into nutrient-rich grey water within 48 hours. The Dallas Cowboys organization is the first U.S. sports franchise to install one of the sophisticated reactors, the parties said. "The Dallas Cowboys strive to be the best in all endeavors undertaken by our organization both on and off the field," said Jerry Jones, Owner of the Dallas Cowboys. "We are committed to staying on the leading edge by embracing environmentally friendly practices at Cowboys Stadium. Adopting the technology Totally Green has developed is another way we can make a difference for our community." Rob Phillips, president of Totally Green, said the Green Machine will actually save the team money. "With our uniquely advanced system, customers dramatically reduce garbage disposal costs, tipping fees, and water and energy usage," Phillips said. "The ORCA Green Machine makes good financial sense and, because it reduces the amount of garbage sent to landfills, it makes good environmental sense."